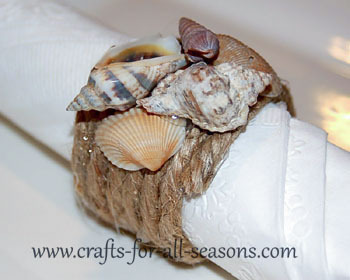 These seashell napkin rings are perfect for entertaining in the summer and your guests will love that you made them yourself! Why buy napkin rings when you can make them yourself? 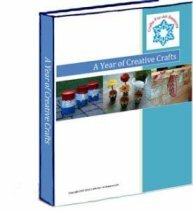 This is a very easy craft to do and with careful storage they will last the rest of your life! 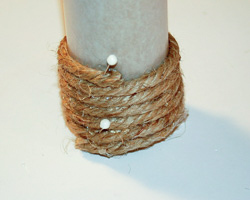 Pair these along with the seashell centerpiece and you have a perfect summer theme for your next dinner party! These really are unique and classy, and will get your guests talking. 1. 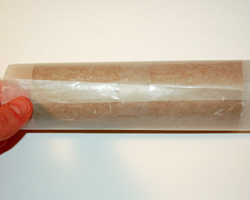 Begin by wrapping a piece of wax paper around the empty toilet paper tube, and tape it together. 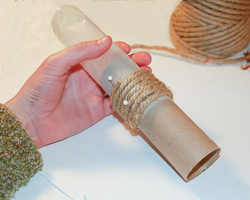 This is your mold around which you will wrap your jute around. The wax paper serves as a barrier between the hot glue (which will inevitably ooze out) and the toilet paper roll. 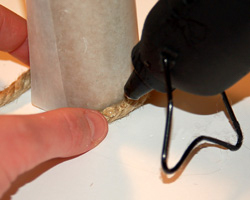 The hot glue becomes "unstuck" to the wax paper much more easily than the cardboard tube. The wax paper can simply be peeled away. 2. 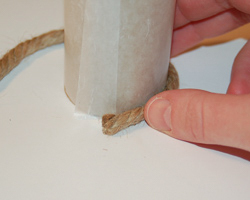 Next, apply a dollop of hot glue to one end the jute, and begin to wrap it once around the tube as shown. Let the hot glue adhere the end of the rope to the next layer, where it meets. 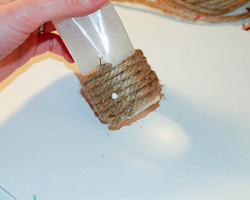 Use a straight pin to adhere the jute to itself until the glue adheres. 3. 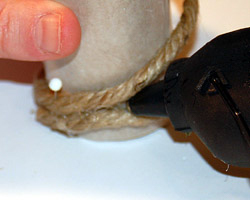 Now, apply a line of hot glue along the top of the rope, then circle the rope around again. Use straight pins to keep everything adhered while the glue dries. 4. 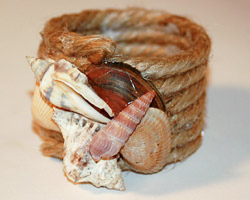 After about 6 wraps or so, cut off the jute and glue the end well to the wrapped seashell napkin ring. 5. After this has allowed to dry, slide the toilet paper roll out of the wax paper shell. 6. Now, gently peel away the wax paper. It may come out easily, it may not, depending on how much glue oozed out. If needed, rip the wax paper and keep working until it is all gone from the inside of the ring. 7. You can now decorate these. 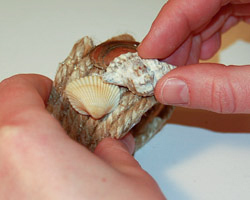 Use a variety of shells in different shapes and sizes, overlapping them occasionally to provide an interesting look. Use hot glue to adhere these in place, and allow to dry. 8. You are ready to entertain! Just slide your rolled napkins into the rings. Be sure to make the seashell centerpiece too, it looks really classy for a summer dinner party!